What base material they are shredding? What is the purpose of shredding the material (recycle, reuse, re-purpose)? What do they want the output to look like once the shredding process is complete? What do they intend to do with the material post-shred? What is further down the process chain? We want to understand the whole process of their operation, and when possible, identify ways to optimize or solve other issues within their process. Industrial Shredders strives to be integrated into their process as efficiently as possible. This process is done with complete transparency and respect for proprietary processes. Once the initial interview with the customer is complete, the concept is brought to the design table. 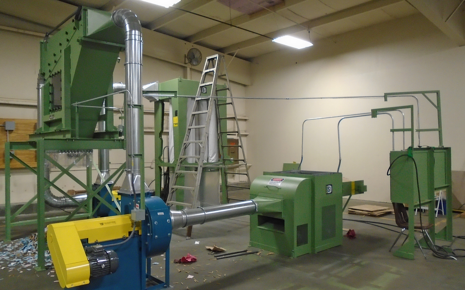 Our client came to Industrial Shredders with a challenge: sourcing equipment to improve the shredding process of their difficult to handle proprietary material in sheet form. The client had an existing process in place, utilizing a single hammer mill, which took considerable time to break the sheet material down into small pieces. Through our design process, we discovered that by shredding the sheets in a 40 Combo first, we could quickly make the initial size reductions and then, a duel hammer mill could be more efficient in achieving the ultimate size reduction. Our contribution was specifying a duel hammer mill in line after our 40 Combo shredder and coordinating the project so our client had one source for the whole solution. This basic three step process optimized their process by 3-to-6 times their current throughput, substantially increasing their yield. Sometimes, like in the example above, a solution requires multiple pieces of equipment to achieve the customer’s goals. Other times, it’s no more complicated than a specific sized slitter assembly. Interested in learning more about how industrial shredders can create a custom solution to your biggest shredding challenge? Contact us below.